Davy Crockett and One Week's Pay: "Congress has no power to appropriate this money as an act of charity." "Mr. Speaker-- I have as much respect for the memory of the deceased, and as much sympathy for the suffering of the living, if suffering there be, as any man in this House, but we must not permit our respect for the dead or our sympathy for a part of the living to lead us into an act of injustice to the balance of the living. I will not go into an argument to prove that Congress has no power to appropriate this money as an act of charity. Every member upon this floor knows it. We have the right, as individuals, to give away as much of our own money as we please in charity; but as members of Congress we have no right so to appropriate a dollar of the public money. Some eloquent appeals have been made to us upon the ground that it is debt due the deceased. Mr. Speaker, the deceased lived long after the close of the war; he was in office to the day of his death, and I have never heard that the government was in arrears to him. Every man in this House knows it is not a debt. We cannot, without the grossest corruption, appropriate this money as the payment of a debt. We have not the semblance of authority to appropriate it as a charity. Mr. Speaker, I have said we have the right to give as much money of our own as we please. I am the poorest man on this floor. I cannot vote for this bill, but I will give one week's pay to the object, and if every member of Congress will do the same, it will amount to more than the bill asks." He took his seat. Nobody replied. The bill was put upon its passage, and, instead of passing unanimously, as was generally supposed, and as, no doubt it would, but for that speech, it received but few votes, and, of course, was lost. "'It is not the amount, Colonel, that I complain of; it is the principle. In the first place, the government ought to have in the Treasury no more than enough for its legitimate purposes. But that has nothing to do with the question. The power of collecting and disbursing money at pleasure is the most dangerous power that can be entrusted to man, particularly under our system of collecting revenue by tariff, which reaches every man in the country, no matter how poor he may be, and the poorer he is the more he pays in proportion to his means. What is worse, it presses upon him without his knowledge where the weight centers, for there is not a man in the United States who can ever guess how much he pays to the government. So you see, that while you are contributing to relieve one, you are drawing it from thousands who are even worse off than he. If you had the right to give anything, the amount was simply a matter of discretion with you, and you had as much right to give $20,000,000 as $20,000. If you have the right to give to one, you have the right to give to all; and, as the Constitution neither defines charity nor stipulates the amount, you are at liberty to give to anything and everything which you may believe, or profess to believe, is a charity, and to any amount you may think proper. You will very easily perceive what a wide door this would open for fraud and corruption and favoritism, on the one hand, and for robbing the people on the other. No, Colonel, Congress has no right to give charity. Individual members may give as much of their own money as they please, but they have no right to touch a dollar of the public money for that purpose.If twice as many houses had been burned in this county as in Georgetown, neither you nor any other member of Congress would have thought of appropriating a dollar for our relief. There are about two hundred and forty members of Congress. If they had shown their sympathy for the suffers by contributing each one week's pay, it would have made over $13,000. There are plenty of men in and around Washington who could have given $20,000 without depriving themselves of even a luxury of life.. The congressmen chose to keep their own money, which, if reports be true, some of them spend not very creditable; and the people about Washington, no doubt, applauded you for relieving them from the necessity of giving by giving what was not yours to give. The people have delegated to Congress, by the Constitution, the power to do certain things. To do these, it is authorized to collect and pay moneys, and for nothing else. Everything beyond this is usurpation, and a violation of the Constitution. "I am not much given to tears, but I was taken with a choking then and felt some big drops rolling down my cheeks. And I tell you now that the remembrance of those few words spoken by such a man, and the honest, hearty shout they produced, is worth more to me than all the reputation I have ever made, or shall ever make, as a member of Congress. "There is one thing now to which I will call your attention. You remember that I proposed to give a week's pay. There are in that House many very wealthy men-- men who think nothing of spending a week's pay, or a dozen of them, for a dinner or a wine party when they have something to accomplish by it. Some of those same men made beautiful speeches upon the great debt of gratitude which the country owed the deceased -- a debt which could not be paid by money --- and the insignificant and worthlessness of money, particularly so insignificant a sum as $10,000, when weighed against the honor of the nation. Yet not one of them responded to my proposition. Money with them is nothing but trash when it is to come out of the people. But it is the one great thing for which most of them are striving, and many of them sacrifice honor, integrity, and justice to obtain it." The story appears to be apocryphal, but its a good tale fit for Davy Crockett, and the moral is undeniably accurate. It was a fine sunny day for ride in the Tennessee countryside, as Barack Obama was out on the campaign trail engaged in his primary occupation as a political candidate. Long gone were the days of serving his country as a social worker - uh… “Community Organizer,” an occupation crafted by Communist writer, Saul Alinsky. Barack was shocked, thinking himself to be loved by everyone. He begged the man to tell him what was the matter - “But I don’t understand,” said the anointed one, “I am the ONE you’ve been waiting for,” he said to the man. “Forgive me, Senator, I intend by it only to say that your understanding of the Constitution is very different from mine; and I will say to you what, but for my rudeness, I should not have said; that I believe you not to be honest, but only vastly inexperienced, naïve and lacking in good judgment in matters of government, as well as in the associations you have kept in the course of your young life,” said Bunce. “I don’t think my wife, my grandmother, and my Muslim family in Kenya have any place in this discussion, Mr. Bunce,” snapped Obama. “I didn’t bring up your wife, your grandmother, or your Muslim family in Kenya, Mr. Obama,” Bunce calmly retorted. “Well just in case you were going to mention that next, I just want you to know that I will not permit my family to be brought into this discussion,” was Obama’s reply. “It is not the amount or the purpose that I complain of,” said Bunce. “It is the principle. In the first place, the government ought to have in the Treasury no more than enough for its legitimate purposes. But that has nothing to do with the question. The power of collecting and disbursing money at pleasure is the most dangerous power that can be entrusted to man, particularly under our system of collecting revenue by a tax and tariff, which reaches every man in the country, no matter how poor he may be, and the poorer he is the more he pays in proportion to his means. “Special interests?” screamed Obama, “But isn’t giving money to provide for the poor, helping the environment, and fighting against global warming in everybody’s best interests?” Why shouldn’t public money be used for such noble causes? “Individual members may give as much of their own money as they please,” answered Bunce, “ but they have no right to touch a dollar of the public money for that purpose. If twice as many houses had been burned in this country’s fires as were flooded by Katrina, neither you nor any other member of Congress would have thought of appropriating a dollar for our relief. But politicians and media made it a political issue and you and others in your Congress couldn’t start writing checks with public money fast enough, but how many of you gave of your own earnings to help the Katrina victims? There are about five hundred and thirty five members of Congress. If they would shown their sympathy for the sufferers by contributing one week’s pay each to a charity fund, they could help out a lot of our people who they profess to care about. There are plenty of wealthy men around Washington whom could give $2,000 a month without depriving themselves of even a luxury of life. “And just where in the Constitution do you find this ridiculous restriction, Mr. Bunce?,” asked Obama. “Actually it isn’t, Senator,” replied Bunce, “If you would read it more carefully and understand the intent of those men who wrote it, you would see that the enumerated power in the first sentence of Article 1, Section 8 is taxation and only taxation. The rest of that sentence defines the power of taxation. Did you bother to read the items that followed where specific powers of Congress are enumerated and the constitutional use of tax money is defined? You might also want to familiarize yourself with the 10th Amendment where it states that all other powers not defined by this Constitution are reserved to the states and the people. For with federal money given for programs comes federal control, and with federal control comes power. These are the powers you would take away from the states and from the people and grant to the federal government. The states should have known better than to enslave themselves to this federal money that the Congress has been passing out, but those in charge of the states seem to have no better an understanding of their freedom and of the Constitution than you do. As Obama walked back to his SUV, he shouted back to Bunce: “And you’ll be hearing from the ACLU and the NAACP for your racist and bigoted comments!” He got back into his motorcade and drove off, leaving his carbon footprint behind. Horatio Bunce went back to his plowing, shaking his head in disbelief at what has become of his country and the arrogance and ignorance of those who want to lead it. Horatio Bunce was an early 19th century Tennessee farmer, student of American Politics and the U.S. Constitution, and a brilliant patriot who was encountered by Congressman Davy Crockett one day on the campaign trail when he was running for reelection to Congress where he served from 1827 to 1833. Bunce was responsible for teaching Crockett the lesson portrayed above. His story is told in It’s Not Yours To Give from which this article was taken and modified to fit a current, 2008 presidential candidate. Whoever would have guessed that (even an apocryphal) Crockett was a poet! The vote in Congress is true, IIRC from an earlier research. Reading on Crockett is never a waste of time. The picture appended to the above story is actually one of a popular actor of the day who portrayed Crockett on stage. Crockett's hair was straight and he was typically clean-shaven when not in the woods. More on "sockdolager." From one of my favorite websites, World Wide Words. The 175th Anniversary of the Battle of the Alamo is coming up, for those who would like to know more about Davy Crockett. "Waal, I guess I know enough to turn you inside out, you sockdolagizing old mantrap." Fixin' up the government, and the laws as well. 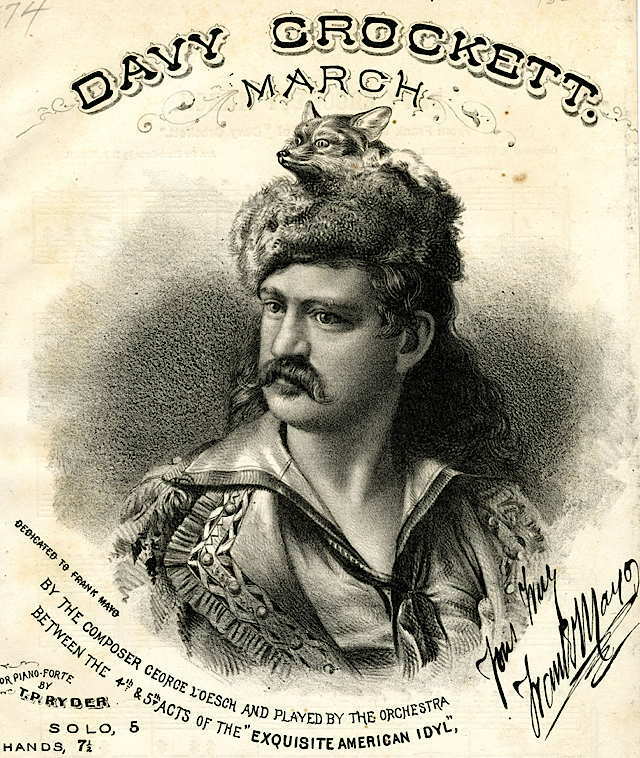 Davy, Davy Crokett, king of the wild frontier. The Colonel was a man to admire. He gave up a promising political career when he broke with Andrew Jackson over the Indian Removal Act. Too bad we don't have any like that now. Not in public life and not in TV or the movies. I have done every kind of search imaginable on my e-Bible, not to mention going through the hardcopy version multiple times. I still haven't found where the Lord commends anybody for giving away another person's money. I'm sure if Jesus had told the Rich Young Ruler to sell all his neighbor had and give that to the poor, the man wouldn't have gone away so sad. I dug into this story. It is a falsehood. "Edward Ellis first published the story, using a pseudonym, in the January 1867 issue of Harper's — a very much longer version than appears nowadays on the Internet. Ellis wrote that version as if Col. Crockett had told the Horatio-Bunce story personally to Ellis — but Crockett had died four years before Ellis was born."